This wrongful death claim was filed in Baltimore City when a surgeon at UMMC Midtown failed to notice a hematoma blocking a patient's airway after neck surgery. It was filed in Health Claims Arbitration on January 25, 2018, and it is the 44th medical malpractice case filed in Maryland this year. A man underwent a carotid endarterectomy, a surgical procedure that reduces the risk of stroke by removing blockages from the carotid artery, at the University of Maryland Medical Center Midtown Campus (UMMC Midtown). He was given a short-acting blood thinner (Heparin) and two long-term blood thinners (Aspirin and Warfarin) after the surgery was completed. Shortly after starting on intravenous Heparin, the man began to show signs of hemorrhaging (bleeding) in his neck, including neck pain, neck swelling, and facial swelling. The man's complaints of neck pain, difficulty breathing, and shortness of breath persisted through the following day. Eventually, that evening, the man struggled to breathe because the undiagnosed hematoma in his neck was compressing his windpipe. 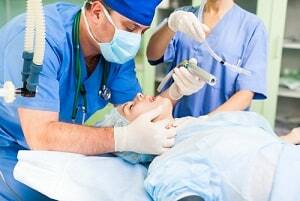 The surgeon was unable to establish an airway, and the man suffocated and died. This study shows that neck bleeding is a relatively common complication after a carotid endarterectomy (CEA). The effect of anticoagulant (like Heparin or Warfarin) and antiplatelet (like Aspirin) medications on CEA outcomes is not fully known, but they may be associated with an increased risk of postoperative bleeding. When serious hematoma complications do occur, they require emergency surgery. The decedent was showing obvious signs of hematoma for approximately 24 hours before he suffocated. Regardless of what caused the hematoma, 24 hours of neck swelling, pain, and difficulty breathing is more than enough evidence for health care providers to suspect and investigate a potential bleed. Although the various blood thinners may have contributed to the hemorrhaging, the plaintiffs' attorneys seem to focus their argument on the delayed hematoma diagnosis. It would be difficult to prove that the excess bleeding was caused by surgical negligence, but the medical team certainly should have noticed and treated the bleed much earlier. University of Maryland Surgical Associates, P.A. Failing to timely recognize that a hematoma was obstructing the man's airway. Failing to timely detect the man's tracheal deviation. Failing to diagnose and treat the man's hematoma. Failing to timely intubate the man or otherwise establish an airway. Failing to ensure that the man received sufficient oxygen between intubation attempts. Wrongful Death: The man died as a result of the defendant health care providers' negligence. Survival Action: Before he died, the man suffered pain, severe injuries, mental stress, underwent unnecessary medical interventions, and incurred medical expenses as a result of the defendant health care providers' negligence. Learn more about UMMC Midtown. Read about heparin and other blood thinners and the problems that can ensue when these medications are not properly regulated.